A few months ago, our ‘Holiday 2015 Giveaway’ was launched on a landing page set up on our site. It ran from November 5th until it ended 42 days later on December 16th, and when the dust settled, the giveaway received a total of more than 45k entries submitted by more than 18k participants. In the post below, we’ll leave no stone unturned and run through all the giveaway promotion strategies we used to get us there. Before discussing the specifics (prizes used, entry options, start/end times, etc. ), it’s important to talk about the goals and purpose of the promotion and the ingredients that made it a success. Promotion Goals. The primary goal of this giveaway was to introduce newcomers to the concept of Rafflecopter. 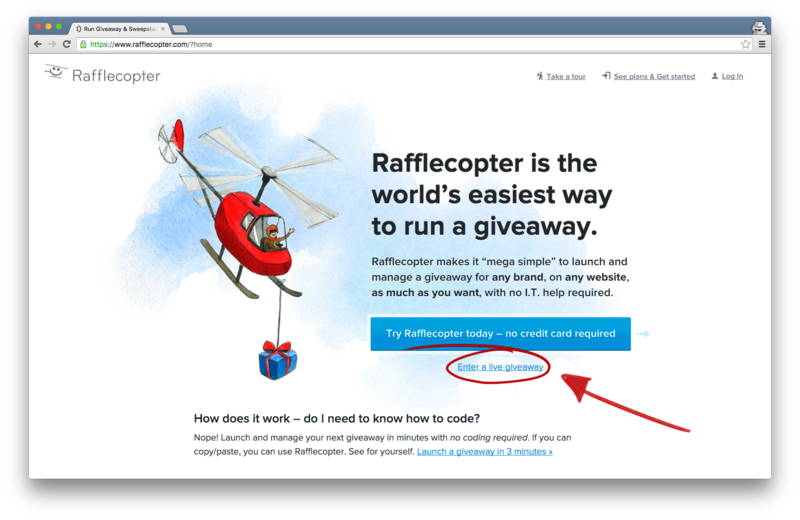 Understanding how Rafflecopter works is best learned through a live example. That’s the main goal of all of our monthly giveaways that we administer, and while this promotion had some holiday flair, this giveaway was no different. But there were also some secondary goals that were still important to us. Every holiday season, we see an uptick in app usage, particularly between November 15th and December 15th. While we normally run regular monthly giveaways throughout the year, putting more effort behind a holiday giveaway (more promotion, bigger prize) was important to us, simply for the reason that we wanted to get our name out there during a time when administering giveaways is more important. Second, we wanted to put a greater amount of effort behind this particular promotion with the hopes that it would be especially successful so that we could share our findings. Yup – the idea of writing this blog post you’re reading now was conceived three months ago. Finally, we love celebrating our fans. While we’re often in the giving mood, we especially are around the holiday season. Throughout the course of November and December of 2015, we gave out more Rafflecopter prizes than we had in the previous six months combined. It was a small way of saying thanks to our community and celebrating the end of the year. Prizes. The grand prize winner for this giveaway won an Apple iPad Air and Rafflecopter swag (t-shirt, button, and five stickers), totaling an ARV (approximate retail value) of $415. Additionally, five runner-up winners won a one-month Rafflecopter premium subscription and Rafflecopter swag (t-shirt, button, and five stickers), totaling an ARV of $99 each. How to Enter. Participants were offered three ways to enter. Through the entry form, they could tweet a message (pre-written by us), join our email newsletter, and/or answer a question (in this case, the question was ‘How did you hear about us?’). Each entry option was worth a single entry into the giveaway. By completing all three, entrants were given a three-times greater chance of winning compared to completing only one entry option. Additionally, the refer-a-friend entry option feature was enabled in this giveaway, which meant that entrants were allowed to gain additional entries into the giveaway by encouraging their friends to visit and enter the giveaway through a unique URL they were provided. Dates. The giveaway was officially open for approximately six weeks. It started the morning of Thursday, November 5th and ended the evening of Tuesday, December 15th at 11:59pm. Location. The giveaway lived in one primary location throughout its six week duration, which was a landing page on our site. We also had the giveaway installed on our Facebook page through our Facebook app, but we never actively drove traffic to that location (more on that below). In sections following, you’ll learn about how the giveaway was promoted, and how it attracted close to 20k entrants. But it would be a mistake to skip over the reasons why the giveaway had the prize it did, and why it ran for a six-week duration. Giveaway fundamentals are important. Adhering to giveaway best practices will make your promotion efforts that much more fruitful. If you heavily promote a giveaway with a prize that has zero perceived value, or if your promotion appears too burdensome to participate in, or if it is too short or long in duration, you’re setting yourself up for failure, and your promotion efforts won’t be worth your time. Prize. Usually when we administer monthly giveaways, we’ll give away premium Rafflecopter subscriptions and some other Rafflecopter swag. It’s a simple way to demonstrate our app to newcomers and is also easy for us to administer. But a Rafflecopter subscription doesn’t appeal to the general population. My mom wouldn’t find any value in winning a year’s subscription to Rafflecopter for example (I love you mom). So, in addition to giving away five Rafflecopter-specific prize packs, giving away an iPad created the potential for a greater entry pool. Learn more about prize selection best practices in our Field Manual. How To Enter. The entry options for this giveaway in particular stayed the same in relation to the monthly giveaways we’ve run. But it’s still important to remember to keep it simple. The three entry options displayed to the entrant were easy enough that it was possible to complete all three within a minute timeframe. Be mindful of the time your potential entrants have to participate. Dates. It was important to us to have a fairly large-scale giveaway running during the time when we could expect an increase in traffic for the goals mentioned above. Thus, the holiday giveaway was launched two days after picking the winners of our October promotion, keeping the momentum from the previous giveaway alive and spring-boarding us into the holiday season. The giveaway timeframe of six weeks matched up well with the dates when we expected to see the most traffic. The giveaway was launched on a Thursday and closed on a Tuesday evening, some of the better days to make announcements (compared to launching over a weekend). It’s important to match the duration of your giveaway to the perceived value of your prize. Between the iPad as a grand prize and five prize packs to five runner-up winners, we felt six weeks matched it well. Learn more about giveaway duration best practices in our Field Manual. Location. We’re believers in owning your content and will always recommend hosting your giveaway on a site where you control the content and entrant’s experience. In our case, it makes sense for us to host the promotion on our website, where we have full control over the design and the message. Just be certain the page you’re hosting it on works just as well from a desktop as it does from a mobile device. Finally, if you’re hopeful to have entrants share the page where the giveaway is located (and we’re hoping you are! ), be sure the page is social-sharing optimized (you can read more on social-sharing optimization here). Looking for more tips and tricks? You can read all our giveaway best practices and recommendations in our Field Manual. The final result is a lovely page, hosting a great giveaway, with a clear message. Below is a screenshot of how the landing page looked when it was launched. Once you’ve nailed down your fundamentals, creating both the messaging creative and promotion schedule will be that much easier. Creating posts and scheduling them ahead of time will allow you to think through ideas of how you’ll promote the giveaway. It’s also helpful for the sake of keeping yourself organized. But knowing how your giveaway fits into your content calendar, blog post schedule, or marketing plan is probably most important. Quick tips: Think about updating your promotion copy depending on how much time is left. Express urgency in your message copy when there’s less than 48 hours left. Create excitement when your giveaway has launched. Use clear, concise messaging. Don’t forget to use compelling CTAs. If appropriate, consider inserting your prize’s ARV in your copy. There’s no right or wrong answer to how often your giveaway should be shared. That’s ultimately something you’ll have to figure out and determine what’s best for you and your calendar. Below, we’ll be sharing with you how we went about sharing our holiday giveaway and the schedule we built, which we thought was the best for us, through Twitter, Facebook, emails, and other channels. We’re hopeful you’ll be able to apply some of the ideas to your own promotions. Twitter is the first place we start. It’s one of our more favored social networks we’re active on – you could say it’s a staple for us. With a large following that’s been growing over the past five years, you’ll find us tweeting any article or content piece that’s related to giveaways or social media about 3-5 times a day. We’ll tweet blog posts we’ve written, case studies we’ve published, and giveaways we’re running. For our holiday giveaway, we set out to tweet about once per day from our account specifically promoting the giveaway, something we’ve never done before. We will generally tweet about promotions we’re running, but usually it’s only 2-3 times a week at most. By the time this particular giveaway was all said and done, the giveaway was tweeted 51 times through our account over the course of 42 days. Ultimately, Twitter was responsible for 21.8% of all giveaway entries (more stats at the bottom of the post). The giveaway was tweeted each evening, and sometimes on the weekends. During the last two weeks, the giveaway was tweeted at least twice on seven different days. Each tweet contained a short description of the promotion, specific CTAs to encourage a click-through, and appropriate images. Below are several example tweets used in the promotion. 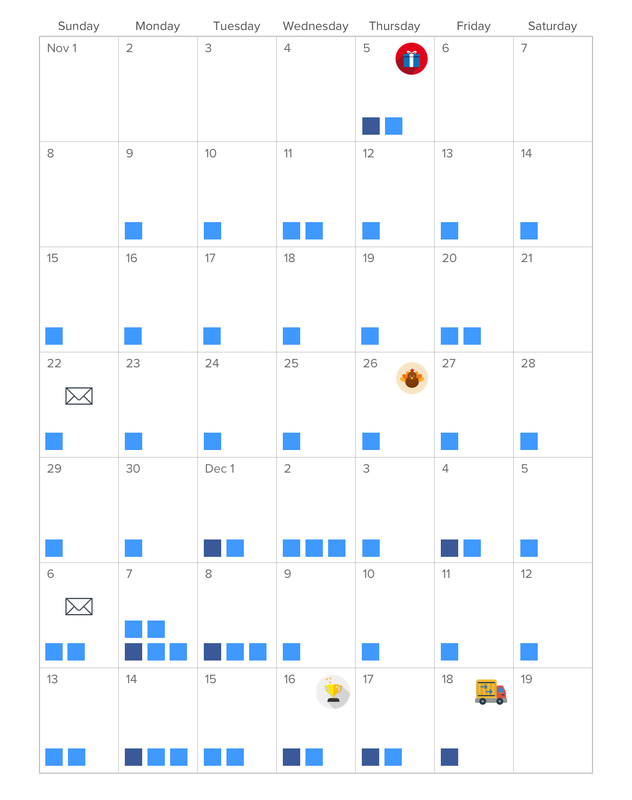 Edgar is an app (think Buffer, but with better scheduling capabilities) that allowed us to manage this schedule. We couldn’t recommend it more. Using Edgar allowed us to test a variation of 10 tweets, which were rotated over the course of the six weeks. The very first tweet promoting the giveaway (embedded below) was kept pinned on the top of our profile page from the time it was tweeted on November 5th until the giveaway was complete in mid-December. The pinned tweet was responsible for 43,417 impressions and 790 URL clicks. And by the time the dust settled, the combination of those 51 tweets accounted for 726,202 impressions, driving 15,710 engagements, 738 retweets, and 8,490 URL clicks according to our Twitter analytics. We’re active on Facebook as well. You’ll find us writing on our timeline 2-3 times a week. We’ll share posts we’ve written, giveaways we’re running, an ebook we’ve written, or a picture or two taken around our office. Facebook isn’t as big of a focus for us as Twitter is, but we still participate, and it’s still important to us to have an active Facebook presence. Over the course of the six weeks, we posted nine updates related to the holiday giveaway. 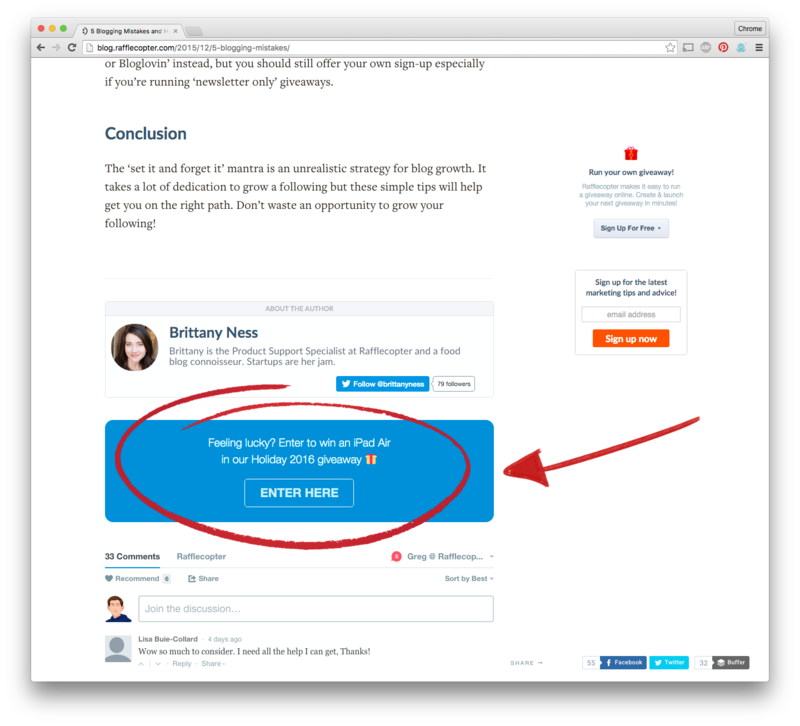 Aside from several flash giveaway posts, each post linked to the holiday giveaway hosted on our site, containing a short description of the promotion, well-written CTAs, and an optimized Facebook link preview (thank goodness for good fundamentals!). Ultimately, our promotions on Facebook were responsible for driving 4.8% of all giveaway entries, about a quarter of the entries received from Twitter. Below are links to all nine updates used in the promotion, followed by a short description. November 5th – This was the first post introducing our Facebook community to the newly launched giveaway. This post was written directly after the landing page went live. December 1st – Happy December! This was a reminder that there are two weeks left. December 4th – A 72-hour flash giveaway we had scheduled to run. While the post is not directly associated with our holiday giveaway, we did eventually bring attention to the holiday giveaway when the flash giveaway was over. December 7th – The flash giveaway ends and the winners have been selected. This was the first time we ran a flash giveaway with a bigger prize (Amazon Kindle) vs. just t-shirts and stickers. The giveaway ended up receiving close to 1,000 entries and reached over 13k people. December 8th – If you didn’t win the flash giveaway, here’s another reminder for your chance to enter our other giveaway still running, which is only open for another week. December 14th – 48 hours left, and the last Facebook update we write about the giveaway while it’s still active, urging fans not to miss out. December 16th – A winner announcement post soon after the grand prize winner and five runner-up winners were selected and announced on the entry form. December 18th – The flash giveaway ends, winners are chosen, and all prizes from the flash giveaway and holiday giveaway are packed up and shipped. The very first timeline post promoting the giveaway (embedded below) was kept pinned on the top of our timeline for the entirety of the giveaway. *Enter to Win! * Between now and December 16th, you can enter for a chance to win an iPad Air or 1 of 5 Rafflecopter prize packs in our Holiday iPad #giveaway. 󾔐Click for details on how to enter – good luck! The pinned post was responsible for 2,369 total impressions, had 42 interactions (comments, likes, and shares), and received a total of 48 clicks to our site. The combination of the above nine Facebook posts accounted for 47,087 impressions, driving 3,058 interactions, and 3,175 clicks according to our Facebook insights. Outside of social media, we also sent out several newsletter emails that highlighted the giveaway. The emails were sent out two weeks apart – the first to a smaller, core group of users announcing the launch of the giveaway and the second to our general newsletter in our December monthly newsletter. Giveaway Launch Newsletter. This email was sent out to a smaller email list of active users to get the party started. The newsletter was sent out on Sunday, November 22nd, after the giveaway had been active for a few weeks. In the past months, we’ve learned that open rates and engagement are higher for us on the weekend. This email was responsible for 12.4% of all giveaway entries. December Monthly Newsletter. This email was sent out to our larger general newsletter list exactly two weeks after the first newsletter was sent out. We typically send out one email a month with general updates, articles we’ve written, and giveaways that are being run. 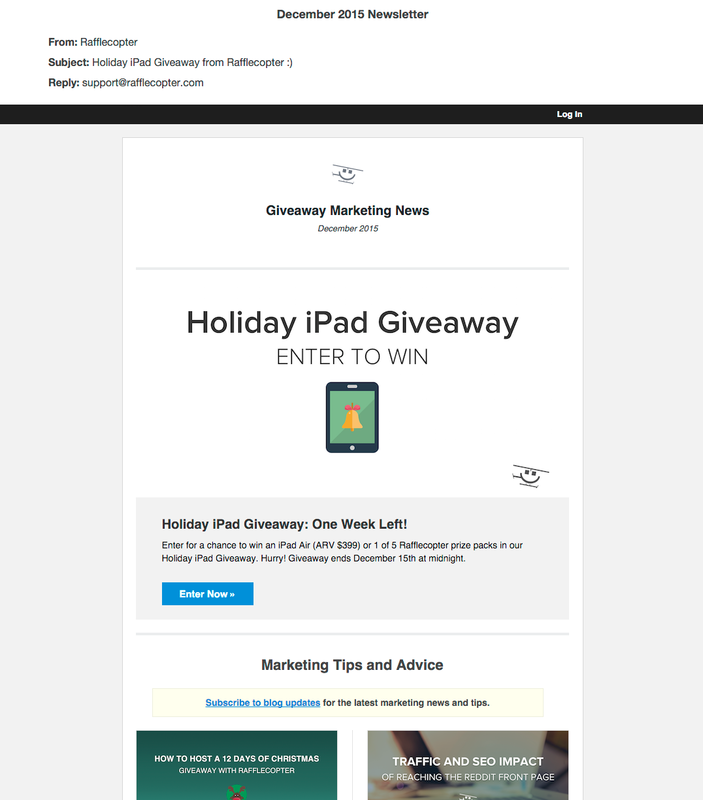 In this newsletter, we highlighted the giveaway at the top of the email. This email was responsible for 22.4% of all giveaway entries. Sending out newsletters is a great way to get the word out and set your giveaway on fire, but be mindful of your customer’s inbox – don’t get too excessive. For our own marketing purposes, we will generally try to mention our monthly giveaway in each newsletter we send, but we don’t normally send more than two emails per giveaway, and don’t usually highlight the promotion unless it’s a special occasion. Below is a snapshot of the traffic the landing page received. The two spikes in traffic were due to the newsletter sends and helped drive traffic in the weeks following the send. Alongside all the promotion we did through Twitter, Facebook, and email, a handful of other tactics were used to drive more visibility to the giveaway, and the three below were the top traffic drivers. Homepage & footer links. If you remember from above, the the primary goal of this giveaway was to introduce newcomers to the concept of Rafflecopter. When someone visits our site for the first time, it’s beneficial for us to show them how Rafflecopter works, and there’s no better way than with an example giveaway. Visitors are linked to the monthly giveaway page from a link on the front page directly below the main button. Additionally, there’s a link in the footer that points to the monthly giveaway page as well. Blog banner. 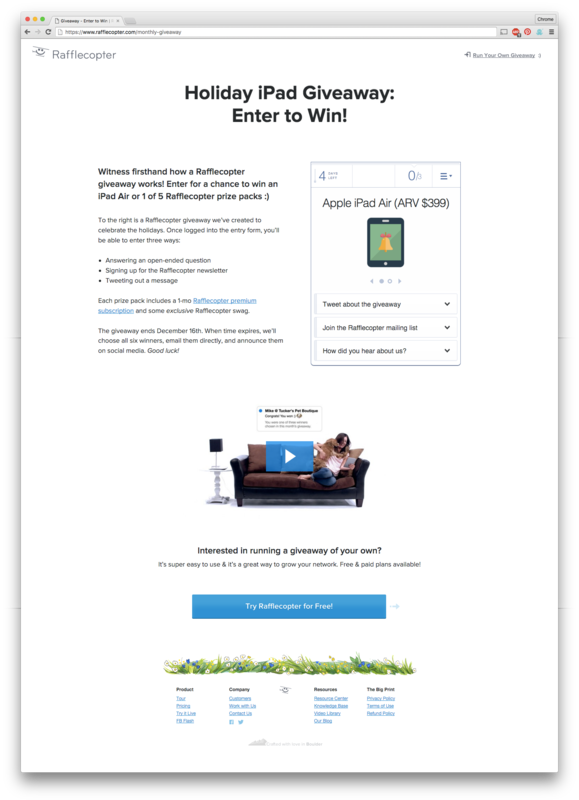 On the Rafflecopter blog, we designed a banner that highlighted the giveaway while it was running. This banner lived below each blog post between the author box and the discussion section. The purpose of this banner is to drive blog visitors to interact with our entry form and learn more about how it works. This banner can be edited from our WordPress dashboard. It’s a site wide CTA we update from time to time depending on what we’re looking to bring visibility to. Giveaway Resources. Our Resource Center is something that we link to in support tickets, in our site’s footer, and in our help and on-boarding docs. It’s an index to a lot of the giveaway-related content we’ve created over the past several years. Sure enough, though, the third item that we list in our Resource Center is to ‘demo a live giveaway and enter to win’. It was only natural to send traffic to our holiday giveaway from here as well. You can visit our Giveaway Resource center here. The graphic below will help you get a better idea of what our promotion schedule for this giveaway looked like. The light blue squares represent one tweet and the dark blue squares represent one Facebook post. Notice the start and end dates (Thursday morning and Tuesday at midnight respectively), the days in which the newsletters were sent out, and how the frequency of the posts increased as the giveaway’s end date neared. Entry totals. Over the course of the six weeks the giveaway was open, it received a total of 18,252 individuals participating, accounting for more than 45k total giveaway entries. Entry option popularity. 97% of entrants answered the question of ‘How did you hear about us?’, and 80% of the entrants entered through the email list entry option. Only 60% of the participants tweeted the giveaway. Number of entry options completed. 51% of entrants completed three or more entry options, while 30% completed two entry options, and the remaining 18% completed just a single option. Refer-a-friend entry option. 813 people utilized the refer-a-friend entry option, referring a total of 1,704 people to the giveaway. 114 people referred more than 3 entrants. Geographical location. 73% of entrants lived in the United States, while 13% came from Canada, and 7% came from the United Kingdom. The remaining 7% were a mix of other international entrants. Mobile vs desktop. 70.2% of the entrants came from desktop, while the remaining 29.8% entered via a mobile device. Of those entering from a mobile device, 40% were from an iPhone and 16% were from an iPad. Top-five traffic sources. Both email newsletters were responsible for driving 34.8% of entries, while Twitter was responsible for 21.8%. Just after Twitter was direct traffic (mostly coming from our homepage) at 19.4%. Google organic and paid search accounted for 7.7%, while Facebook completed our top-five list at 4.8%. Hopefully you were able to take away some ideas for your next giveaway through this post. If you’d like to know any details that weren’t mentioned above, please feel free to AMA in the comments below. If you have any other tips that have helped you drive traffic to your giveaway, please share! Excellent breakdown of your giveaway promotion strategies! We specialize in driving traffic to giveaways and are always happy to help! Thanks for the feedback Bridget! 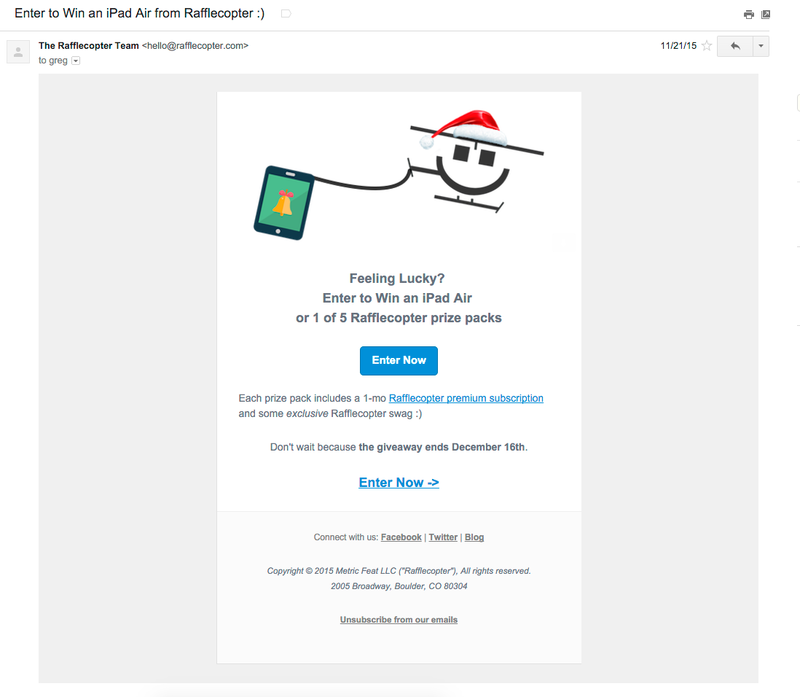 Rafflecopter was so successful in getting entries from their existing fans because they were giving away a high-appeal prize, and more importantly, they ALREADY have a large existing following of people who enter giveaways. They didn’t need to reach too far outside of their existing fans to pull the numbers that they did. The average giveaway without the hot prize and perfect existing audience won’t see the same results without promotion outside of their existing followers/subscribers. Facebook post boosts/ads can be effective as well, but it does take quite a bit of time and demographic tweaking to reach the right people. Bridget, can you email me so that I can get more info on submitting my giveaways to you? I’m actually about to set up another giveaway with Rafflecopter, and I would love to get it out there to more people. I will have to start out small and I noticed you have a $5 package? I would love to find out the details of that. My email is kdp7508@gmail.com Thanks so much!